From the idea to the release for series production, we are here for you when you need swift and dependable solutions. We offer our customers individual parts development and assembly component optimization in the segment compression springs, punching, and bent components. We supply our expertise to develop a product that can be produced. For this purpose, we cooperate closely with our customer. 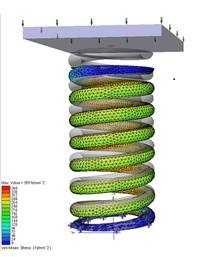 Calculations and designs for structurally and dynamically loaded compression springs. Calculations (structural analyses, final element calculations) to determine the physical properties and perfect component designs. Construction and component simulation with the latest 3-D technology. Development of individual packaging solutions.